A few books came in last week – the first new arrivals since May! I do love a good book order to celebrate the start of autumn. Guard Your Daughters by Diana Tutton – Simon deserves a commission on this sale since it was his glowing review that pushed me to buy it. He thinks it is better than I Capture the Castle so obviously I cannot wait to get started. County Chronicle by Angela Thirkell – I continue to steadily build my Thirkell collection. 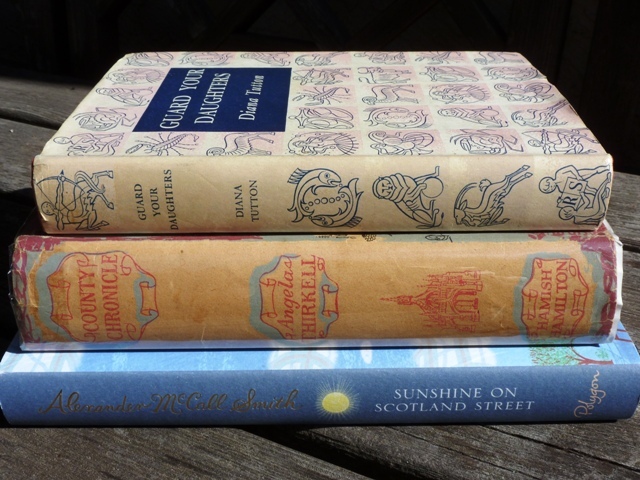 Sunshine on Scotland Street by Alexander McCall Smith – Lyn reviewed this a couple of weeks ago. Before that, I hadn’t even realised it was out! A Very Great Profession by Nicola Beauman – I read this last year (though I never reviewed it) and have been eager to get my own copy ever since. I am not certain how soon any of these will get read. 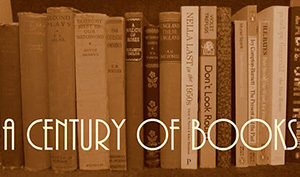 Right now, I am trying to catch up on my reviews and focus my reading on books for my 2012 challenges – My Century of Books, which is going well (I’ve read 70/100), and the Eastern European Reading Challenge, which is not (I’m at 6/12). 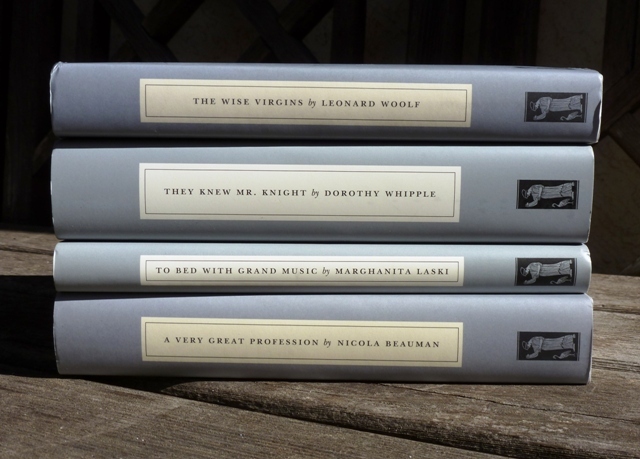 However, it is lovely to know that I have these waiting for me, whenever I may find the time. To think that I had that particular Thirkell and parted with it … I thought I’d never read it, and now your enthusiasm for Thirkell has made me wish that I had! And as the book is set in the reign of James, son of Charles II, I thought I’d try Restoration by Rose Remain so that later I can buy and read Merivel also by Tremain (if, of course, I enjoy Restoration.) I’m well into the 1600s at the moment! Margaret, every time you remind me about your having had then parted with your Thirkell collection, it makes me wince. But oh well, hopefully they went to a home where they are now being greatly enjoyed! Hurrah for Guard Your Daughters! I watched 20 or so copies disappear from Amazon.co.uk, let alone the other sources of it… can’t wait to hear your thoughts, although I’m wishing I hadn’t slipped in that better-than-ICTC comment, because I’m setting myself up for a fall! I liked the boldness of the “better than ICTC” statement. Sure, it may set you up for some flack from picky readers but at least you’ll have created a bit of harmless controversy – think of the added entertainment value for other bloggers! And since (now don’t let this go to your head) I think you have flawless taste in books, I’m pretty sure I’m going to love it too. What a lovely old copy of County Chronicle! I had to check mine to remind myself which one it is – and ended up reading around in it for 15 minutes or more, when I should be getting ready for work. My copy of Guard Your Daughters has also arrived. Isn’t it pretty? I think this is probably my favourite of all the original cover designs. Wonderful books to arrive on a fall day! I made such a long list of books I want to read when I was going through A Very Good Profession last year! It felt like I was writing down at least one new title for every page I read. But I think that was part of the fun of reading it! Simon certainly deserves credit for starting a run on available copies of Guard Your Daughters! I know I wasn’t the only one who immediately went online and bought a copy. I hope we’ll hear what you think of it! Doesn’t he just? I think it will be a while yet before I read it (I need to work through my challenge books first) but rest assured there will definitely be a review when I do! Parcels of books in the mailbox, does it get any better?! Enjoy your wonderful reads, Claire, and don’t keep us waiting too long for those reviews! The reviews are coming, Darlene! Sort of. Not as quickly as I would like. Glacially, actually. But they are coming! I haven’t read any dovegrey books in a while. Don’t you miss the Persephone Weeks? I only have one unread here and saving it for another event of the sort. Wishful thinking.